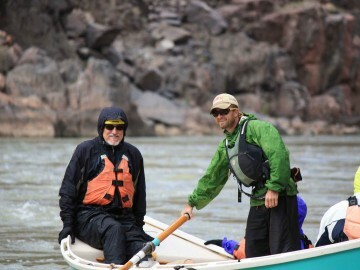 Ever wonder what your river guide is thinking before running a killer rapid? Read on to find out. Pushing up to the scout beach, I slow down in the water just long enough to jump up, bounce off the yellow tube and grab my bowline. Feels like I was here just yesterday. I experience déjà vu as I tie up my boat, unclip my throw bag and tell my guests to stay in the boat. I start walking downstream towards the rapid. It’s 9 a.m. and we’re starting off with a bang. I realize that for me, there’s no better way to begin a day. The roar of the water grows as I climb higher, finally reaching the point where I can see the complete view of the rapid from top to bottom. My eyebrows reach up and instinctively a grin spreads on my face. The trip leader begins to motion to the entrance waves as the other guides gather closer to hear. A quick look-see and I realize the water has dropped since my last run. “Hmm,” I say out loud, to myself, knowing I’ll have to adjust my line to this flow. The river has a way of always keeping it interesting. I spot the entrance, the green tongue so familiar from many past runs, and it leads the way like a smooth slide. The first major feature is a jumble of rocks on the left, obstructing the channel and guaranteeing to get me stuck. The middle is chock full of rocks, and the right side isn’t an option. 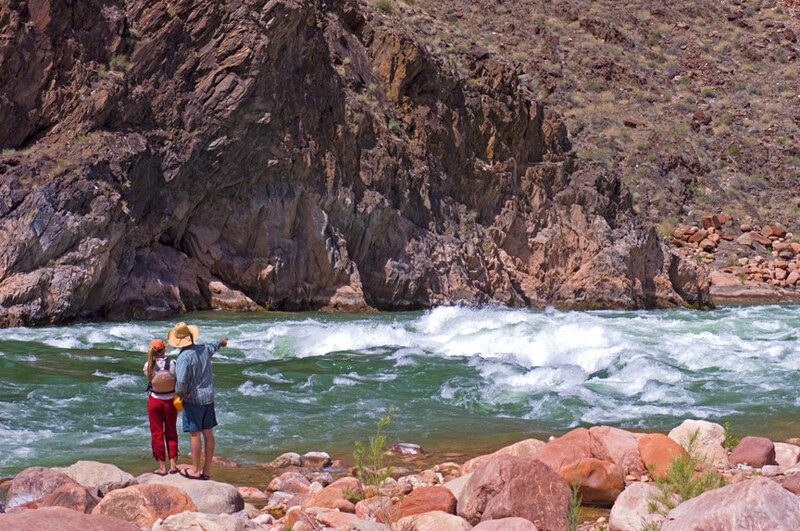 I see the slot, the calm water amid the churning whitewater, and I know that’s my line. I’ll need to stay on the right side of the green tongue, waiting til the exact moment where I can sneak through the narrow entrance. 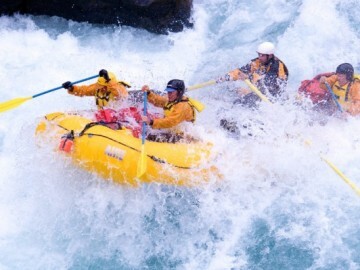 This move is all about timing, all about finesse, and all about keeping calm in the heart of loud and fast whitewater. I’ve run this rapid what feels like to be a hundred times but I still feel those nervous butterflies making their way into my belly. My eyes scan down to the bottom of the rapid, where there’s a massive wrap rock dead center. 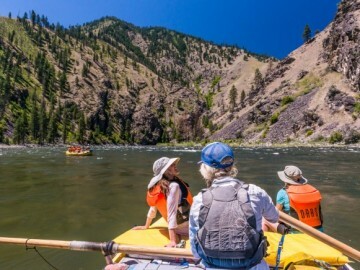 I shudder, remembering my first year rafting, running right up onto it and stamping my boat on its side for a good hour. Never again I told myself, and this time will be no different. I find my marker rocks at the top and note the major features to avoid. We decide on boat order, and with one more quick glance at the rapid, we’re on our way back to the boats to run it. I check in with myself and note that I’m feeling good. Calm. Excited. Focused. Pumped. I know what my line is. I have trained my crew well, and I’m confident we’ll get to where we need to be. I brief them on the Plan, including the Plan B (and C), tighten up PFDs and push off into the current.